Small "Oinochoe", cloverleaf can, made from beige clay with brown painting. Nordic Spear Point, Mesolithic, presumable older, made of a Silex Flake. The shafting area can be recognized well. The point dates from an underwater find place, therefore a beautiful bluish patina! 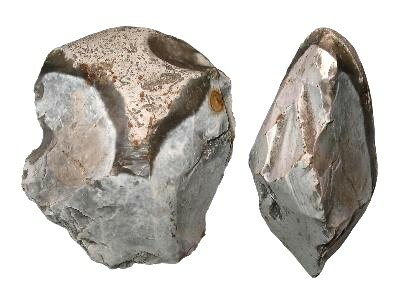 Nordic Chopper (Pepple Tool), made of an Silex Pepple. 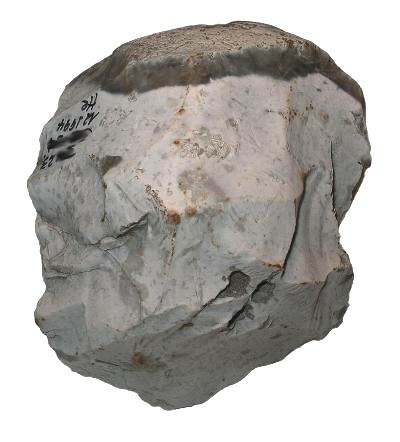 The artifact dates from a nordic site from where scientific acknowledged hand-axes (bifaces) are found. The handle surface for the palm consists of the smooth cortex of the Silex pepple. Disc shaped artifact from pale brown Silex with beautiful crystal inclusions. The Silex is slightly transparent. This artifact is presumably a Weapon, a throwing disc, jagged, with still very sharp edges. The handle surface to throw him without own injury is present. All of them could be thrown with one hand, so they have a limited size, are disc shaped and are jagged (have sharp points). Further on, they always have a handle surface at the edge for throwing without own injury. Group of large nordic Flakes/Knifes, made of Silex. The artifacts dates from an underwater find place, therefore a beautiful bluish patina! Nordic Spear Point, Mesolithic, presumable older, made of a Silex Flake. The shafting area can be recognized well. Typical Flake Celt (Scheibenbeil, Spalter), made of a Silex Flake. Knife made of a Silex Flake.